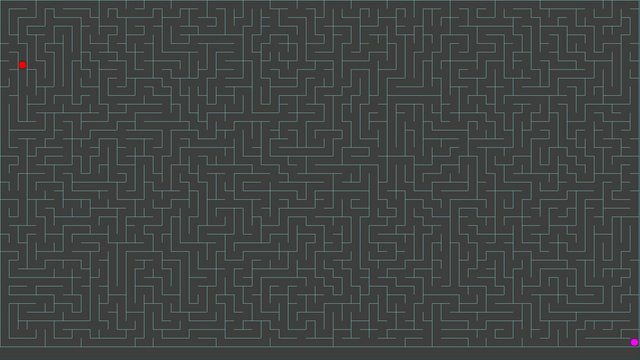 was bored.. made a maze game.. use arrows to move, or change them to something more suitable for you. change the ROWS to a higher value to make more difficult. if you make the maze real big, change the gridlineSize to 1.. anything over 160 or so it pretty much unplayable. changed alot of things.. mazes much larger than screen size possible.. use middle mouse button to pan map.. H for help. info := "This maze consists of " maze.cell.maxindex() " cells.`nIt took " renderTime " seconds to create the maze." info .= "`nYou have made " maze.moveCount " moves so far." help := p1North " moves north.`n"
help .= p1East " moves east.`n"
help .= p1South " moves south.`n"
help .= p1West " moves west.`n"
help .= panIt " pans the map.`n"
help .= goHome " changes the view to the starting cell`n"
help .= goEnd " changes the view to the ending cell.`n"
help .= goMe " changes the view to your current position.`n"
help .= helpMe " brings up this box.`n"
help .= mazeInfo " shows map info.`n"
help .= togglePath " toggles the travled path.`n"
MsgBox,,Woot!, % "You win!`nIt took " this.movecount " moves." Really like the game! Multiplayer mode would be great. ton80, you should add a Zoom-in/ Zoom-out function by scroll-up/scroll-down. If possible, can you add a coloured path in the lane we traveled on before? Other than that, great game! you can view your traveled path by hitting P, hit it again to hide it. Oh I didn't knew that. I have been trying to edit the code to screen ratio 4:3 (1.333333333) but keep getting bugs. I was unable to find the finishing point. Good luck improving this great game.